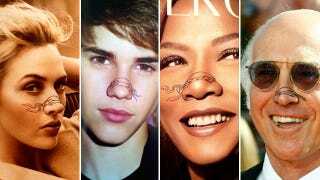 Why Not Turn A Celebrity's Nose Into A Teenage Mutant Ninja Turtle? Ever wonder what your favorite celebrity's nose would look like if it were to dress up like a Ninja Turtle for Halloween? Welcome to Teenage Mutant Ninja Noses, a site completely filled with photos of famous people with TMNT noses drawn on them. This, as they say, is exactly why the internet was invented.